I am glad to see that in future, I shall not have to trail around with a lot of low life drunkards. I am taking Mr-Hunt’s offer and spending my next night out with him. Just when I was settling down again to win the war in the quickest possible way you start writing and I have to lay the war aside and reply to you. Someone take care of it. We are waiting around for a job to break and getting just as brassed as can be as there is no signs of it yet. I have managed to connect up again with the old mob so the nights in town still go with a swing. If they get any more exciting it will end up with a few of us swinging. After English beer there doesn’t seem to be a lot of pleasure in life but I am making the best of it and getting quantity if not quality. you give I think Dave will soon be stuck in jail so you can put someone with a better character in the job. I fell in with a WAAF the other day whose brother is a T. U. minder working round Park Royal. Kitteridge. Does Jack Denny know anything of him? The sister is very nice and I’d like to be just as obliging. If he should know anything you might let me know as this bird hasn’t seen him for over a year. bit of blasted furniture up here now. I heard from Bill Smith and shall reply when I can find something to write about. At present there is a proper lull on all fronts so it is all I can do to get this one off. Tell Fred Honeycombe I was sorry I missed him and hope he is doing ok. Remember me to all. I shall try and whip something up for Bill Blackburn but at present the old bean is a bit dead. 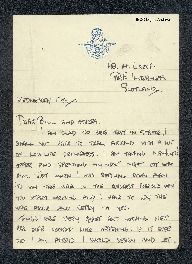 Peter Lamprey, “Letter from Peter Lamprey to W Gunton,” IBCC Digital Archive, accessed April 24, 2019, https://ibccdigitalarchive.lincoln.ac.uk/omeka/collections/document/6641.